They are very interesting couple – Adam is an art director, Laura is an actress and a really creative and a bright lady. Like every girl she wanted a special and beautiful wedding dress. But she didn't want just a white with lace dress. In her imagination, it was colorful, artistic and a bit crazy. Adam didn't mind, he liked this idea as much as his fiancé. Favorite things became pattern items. 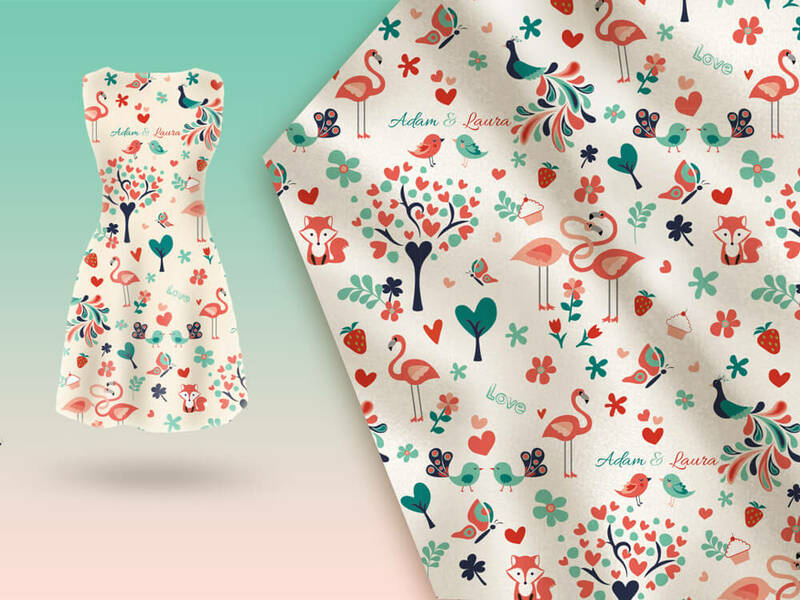 Laura likes next things – cakes, flamingos, peacocks, love birds, ladybirds and little foxes. I thought it would be great to put those things in the pattern. And I was right – they liked it. The pattern was going to be screen printed onto white fabric, so it looked perfect every bright color in the pattern. So, now I'm sure that the wedding dress with this pattern is definitely unique, unusual and magnificent.